Remedy For Foreclosures Has Economists Divided About 25 percent of households with a mortgage owe more than their house is worth. To prevent further foreclosures, some economists want the government to take bolder action and automatically refinance homeowners. Others say it should back away and allow the market to chart its own course. 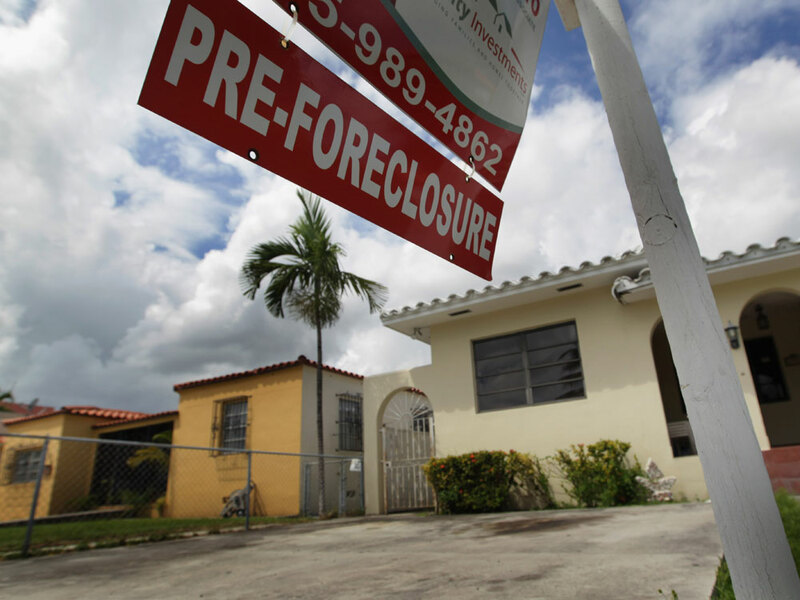 Some economists want the government to automatically refinance homeowners to prevent further foreclosures. Despite the government's efforts to help the housing market, economists estimate that about 1 in 4 households with a mortgage owe more than their house is worth. Foreclosures continue to rack up -- they hit a record high last month. And home construction remains near a 50-year low. Some analysts say the government has done too much already and that the market should be left alone. Others think the government should take bolder action. William Wheaton, an economist with MIT's Center for Real Estate, says the housing market is woven into the fabric of the economy: There are hundreds of thousands of residential construction jobs, and the fall in home values affects Americans' ability and willingness to spend money. There are also subtle impacts. For example, if someone is stuck in a house they can't sell, they're less likely to move to take a better job in some other part of the country. Losses on foreclosures also hurt banks. The possibility of several million additional foreclosures could also push house prices even lower. "What worries me is that the recent data suggests as many as 25 percent of people who have mortgages in the U.S., those mortgages are underwater," Wheaton says. A homeowner is "underwater" if they owe more than their house is currently worth. Wheaton says that's going to result in more and more people deciding to just walk away from their homes. For example, a homeowner living in Arizona who paid $600,000 for a house that is now worth $300,000 is likely to walk away. Wheaton says the solution is for lenders to cut the amount people owe to the value of their house. In the case of the Arizona homeowner, the bank would forgive $300,000 of the loan. But in exchange, the homeowner would give up half of the gains as the house appreciates. "In many situations in economics, you resolve these conflicts through what's called a 'bargaining solution,' where you split the losses," Wheaton says. The alternative, he says, is an additional 2 million to 3 million foreclosures. Or the government could automatically refinance millions of homeowners -- a plan proposed by economists R. Glenn Hubbard and Christopher Mayer of the Columbia Business School. "If we had normally functioning markets, we would have already seen 30 million people taking out new mortgages," Mayer says. With home prices down and tighter lending standards, many people can't qualify to refinance right now, he says. So they are stuck paying interest rates around 6 percent or more. A typical borrower could save around $2,000 a year if they could refinance at today's lower rates, Mayer says. He is calling for the government to "reach out to 37 million borrowers with government-guaranteed mortgages and offer them an inexpensive and expedited opportunity to refinance their mortgages." He says this shouldn't cost the government a lot since it's already on the hook, guaranteeing most home loans through Fannie Mae and Freddie Mac or other avenues. "The government is the market," Mayer says. He says that refinancing loans automatically will mean homeowners will be better able to pay their mortgage and less likely to default. What's more, he says, it will put more money in people's pockets to spend and stimulate the economy. Anthony Sanders, the director of the Center for Real Estate Entrepreneurship at the George Mason University School of Management, says the government's earlier efforts to prop up the market have already resulted in a takeover with the government guaranteeing almost all new home loans. "When they intervene, good luck with getting them out of there," Sanders says. "Where does this stop?" He remains concerned about unintended consequences. Maybe these proposals would somehow result in more losses for banks down the road. After all, if homeowners are paying less on their mortgages, a bank, a group of investors, or a pension fund somewhere will no longer be getting those higher interest-rate payments. Sanders says it's time for the government to back away from these interventions and allow the market to chart its own course.